This is the route we took for today's ride. It starts at the middle of the map at the Santa Barbara County campground called Live Oak Camp, which is only available for rent by groups with reservations. For day use by riders there is a rig parking area, and single day or annual passes can be obtained from the Cachuma Lake ranger station. 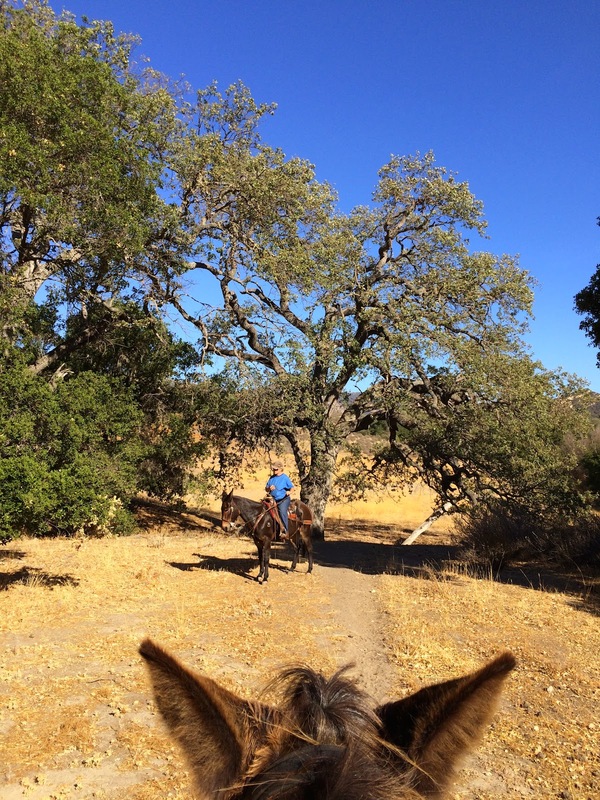 The trail crosses the Santa Ynez River, this section being now completely dried up because of the drought, and then passes through a variety of chaparral woodlands and valleys out to the lake view. To ride the complete periphery of the area would include the central open area shown filling the bend in the river, and takes about 4-5 hours. 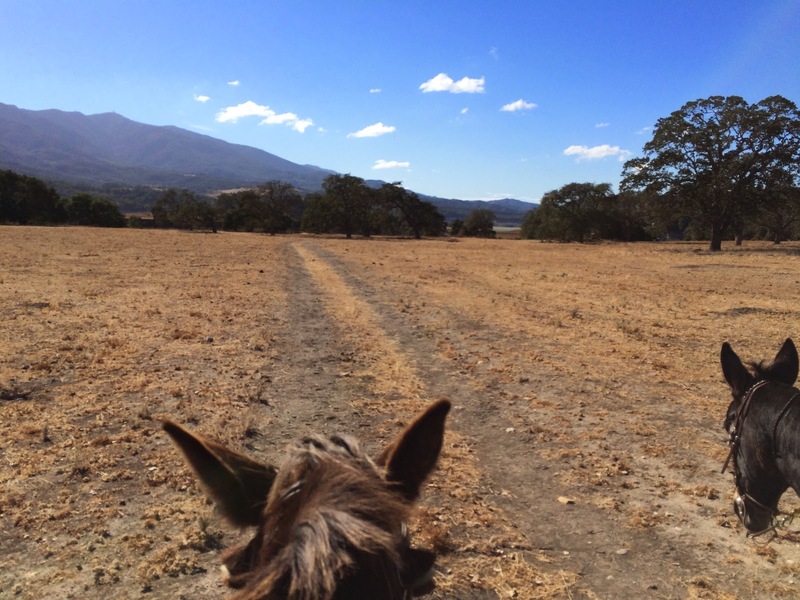 Because Tobe and I have not been trail riding for many months we opted for a shorter route. We started out on the trail leading up to the first lake overview, in high spirits on a bright day. The BackCountry HorseMen had hundreds of people camped at Live Oak Campground, enjoying the perfect Fall weather and the good company. You can just barely see the lake in the distance, top left, currently at 30% of normal capacity due to the drought. I saw a gal on a mule and asked if I could ride with her. Turned out she'd only had Rose for a few weeks and was glad for the company as she did a test-drive, and Tobe was happy to show off in front of a pretty little girl mule. Much of the trail is wide enough to drive a service vehicle on, and the severe drought is everywhere apparent in the sere grass and struggling chaparral. Here are Cheryl and Rose posing under a particularly beautiful Californis Live Oak tree, Quercus agrifolia. The trees are able to withstand the drought much better than the annuals. 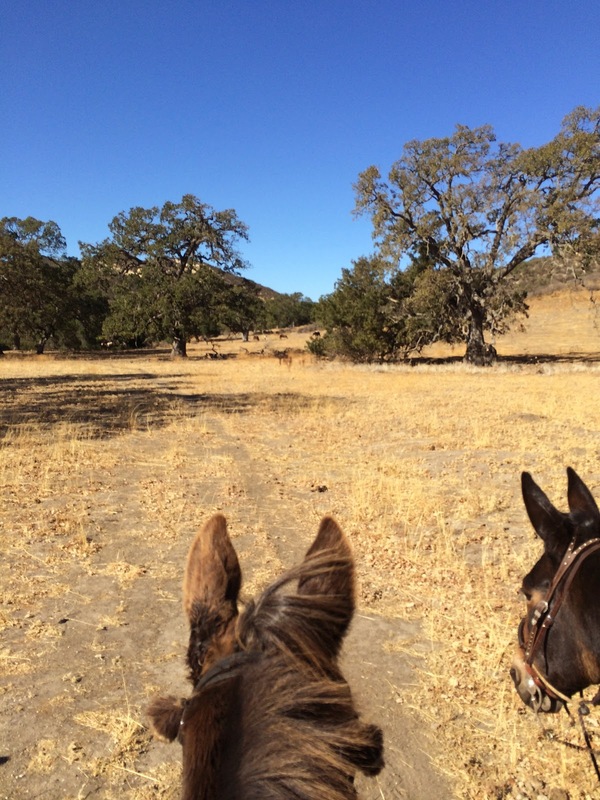 In front of us under the oaks are tiny silhouettes of horses, the young stallions that belong to the bucking horse herd that lives on the property. I made the decision to ride a bit closer, and you can see both Tobe and Rose were quite avid to meet these wild brethren. I WOULD have continued to take photos but things got a bit Western. The young wild ones were just a bit defensive, and we put all our attention to asking the mules to behave in a deferential and calm manner, and then we went on our way. Seeing the bucking horses is always a treat, and a test, because sometimes Tobe Mule acts like he wants to run off and join the circus. Here is a slow-motion visual of the flopping ears of a happy mule going calmly down the trail. 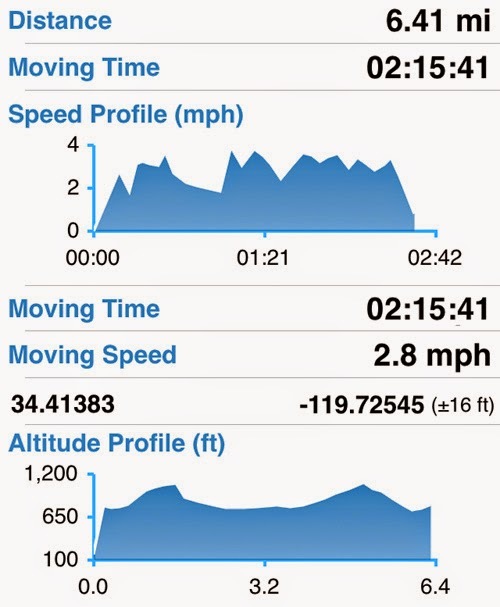 This is the information stored about the ride in the GAIA GPS app I was using. I had this running in the background of my iPhone as I traveled, making the trail map with waypoints, and used the iPhone to take the photos. Good times!